The Lagos State Government on Monday announced the suspension of approval for development of tank farms in Apapa as part of its renewed effort to restore sanity completely as well as fashion out immediate and long term solution along the Oshodi-Apapa corridor and prevent a repeat of the chaos caused by containerized trucks and tankers parked on the road. Rising from a closed door meeting with stakeholders in the maritime and transport sectors, including Nigeria Ports Authority (NPA), Shippers Council, Tank Farm Owners, Department of Petroleum Resources, Security Agencies and Clearing and Forwarding Agents, held at the Lagos House in Alausa, Ikeja and chaired by State Governor, Mr. Akinwunmi Ambode, the State Government also resolved to accelerate and complete work on the Bola Ahmed Tinubu Trailer Park in Orile within the next one month. The State’s Commissioner for Transportation, Mr. Ladi Lawanson who briefed Government House Correspondents on the resolutions reached after the meeting which lasted for over three hours and said all stakeholders had resolved to work together to bring back sanity on the Apapa axis and would therefore not hesitate to sanction recalcitrant operators who flout the resolutions going forward. Lawanson, who was joined at the briefing by the Managing Director of NPA, Mrs. Hadiza Bala-Usman, Secretary to the State Government, Mr. Tunji Bello and other stakeholders, said that a Security Task Force has been constituted by the Federal Government and the Lagos State Government and would work continuously for 30 days to bring sanity to the roads, while shipping companies sanctioned for non compliance on utilisation of holding bays in the ports have been extended by five days. He said that to also cushion the effect on the traffic experienced by motorists in the area, the Federal Ministry of Power, Works and Housing would immediately commence palliative measures on bad portions on access roads. State Chairman, Road Transport Employers Association of Nigeria (RTEAN), Alhaji Mohammed Musa; Secretary to the State Government, Mr. Tunji Bello; Commissioner for Transportation, Mr. Ladi Lawanson; Managing Director, Nigeria Port Authority (NPA), Hadiya Hadiza Bala Usman; Permanent Secretary, Ministry of Transportation, Dr. Taiwo Salaam; Chairman, Amalgamation of Container Truck Owners Association, Mr. Olaleye Thompson and Lagos Sector Commander, Federal Road Safety Corp (FRSC), Mr Hyginus Omeje, addressing Government House Correspondents shortly after the Governor’s meeting with NPA, Tank Farm Owners, Shippers Council and other Stakeholders on the Apapa Traffic Situation at the Lagos House, Alausa, Ikeja, on Monday, July 23, 2018. “The Department of Petroleum Resource (DPR) is to ensure that Tank Farm owners comply with holding bay requirements, while trailers not called upon and found trampling will be impounded and sanctioned in Lagos. “With immediate effect, Lagos State Government suspends the approval of Tank Farms and the Government is going to accelerate the completion of the Bola Ahmed Tinubu Trailer Park and it should be ready within a month,” Lawanson said. The State Government also directed that all truck and tanker owners must be duly registered and well regulated by their unions, adding that the unions would be held accountable for their adherence to extant rules and regulations. “The Nigeria Ports Authority (NPA) in collaboration with the Lagos State Government will going forward license trailer parks whereby only trucks housed in those designated parks will be granted access. Furthermore, tank farms without adequate loading bays within the next 30 days will be sanctioned. “These resolutions were arrived at and agreed by all parties and all parties have resolved to jointly implement these resolutions and the effects will be seen by Nigerians very shortly,” the Commissioner said. Prior to the meeting, it would be recalled that the State Government had last week set up a Joint Task Force involving security agencies and stakeholders in the maritime sector to remove all containerized trucks and tankers parked along the Apapa axis. Tagged ‘Operation Restore Sanity On Lagos Roads,’ the Task Force involving 2,271 personnel drawn from the Police, Lagos State Traffic Management Authority (LASTMA), Lagos State Emergency Management Agency (LASEMA), Nigerian Security and Civil Defence Corps (NSCDC), Federal Road Safety Corps (FRSC), and Nigerian Military including Army, Air Force and the Navy moved into the area on Friday in an operation that lasted for over 72 hours to open up the service lane in the axis to ease traffic. Lagos State Governor, Mr. Akinwunmi Ambode on Tuesday commissioned the Alapere Road and junction improvement works in Agboyi Ketu area of the State, with an assurance that his administration will continue to judiciously put the monies paid by tax payers to good use. 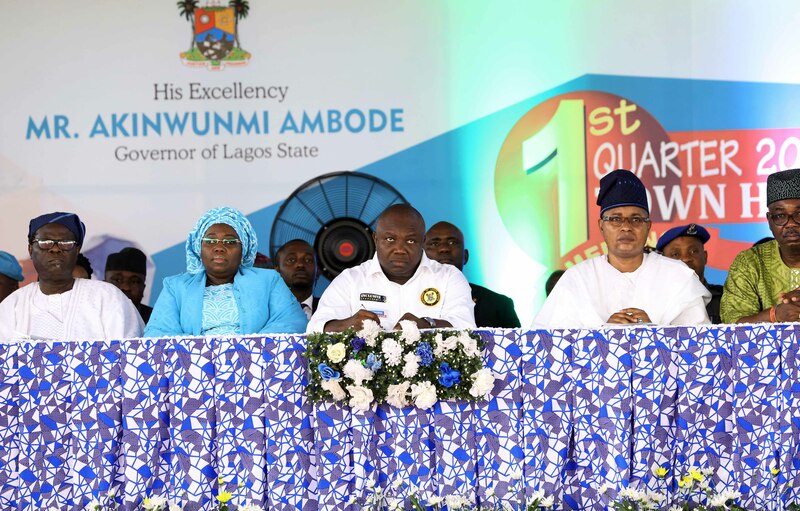 Governor Ambode, who spoke at the commissioning ceremony, attended by party leaders, key stakeholders and scores of excited residents, said the 1.4km road was a fulfillment of one of the recommendations of the Traffic Summit organized by his administration in November 2015. He said the summit, among others, recommended that critical road junctions should be redesigned, improved and or upgraded to meet present and future needs of road users to reduce travel times and support economic activities. “Undoubtedly, this infrastructure, with the improvement it has conferred on this axis, and the signalization of the traffic here, will not only serve the purpose of reducing travel time and resolving traffic gridlock, it will also increase the value of properties in this area and become a source of prosperity to the owners. That is the Lagos of our dream. A Lagos where we all succeed, together,” the Governor said. Governor Ambode also announced the approval for the commencement of the Phase three of the government’s Traffic Intervention Plan in the Ketu – Alapere Area, including the Dualization of the Demuren Road (Alapere Roundabout to Ketu Junction) and Davies Streets (Mr Biggs Junction to Mile 12). He said the Phase three is a strategic linkage between the Third Mainland Bridge – Ogudu – Alapere Corridor via Alapere and Ikorodu Road – Ketu – Ojota – Mile 12 Corridor and that it would provide an alternative route for Lagosians, thereby taking pressure off the Ojota Interchange. The State Government had earlier delivered a standard Layby in Alapere and many inner roads in the axis as part of its comprehensive plan to decongest traffic in the area. Responding to an appeal by residents for the construction of the Agboyi-Ketu Link Bridge, the Governor assured that work would commence on the project before the end of the year. “We have talked about the Ketu-Agboyi Link Bridge in the Town Hall Meeting; I know that is the most important project in this community. So, we have a contract between this community and government that that is what you want and so we will give it to you,” the Governor said. Governor Ambode seized the occasion to thank residents who willingly gave up their properties for construction of the road, saying that the gesture made the delivery of the project possible on schedule. “Our government sincerely acknowledges the contributions of all those behind the successful completion of this project especially all those who readily gave up their properties without recourse to litigation. We must publicly commend them and show our appreciation as the construction of this road was made easy for Government because of these individuals and institutions. This is indeed one of the few places in Lagos where people have supported Government’s developmental efforts without recourse to litigation or protest and we acknowledge this sacrifice,” he said. 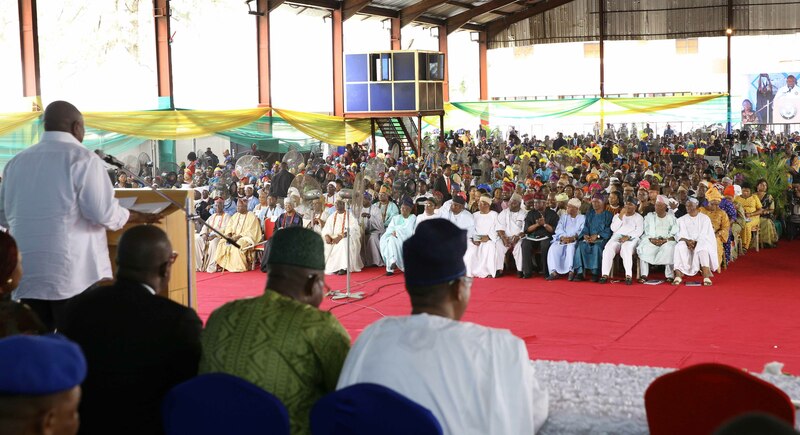 Besides, the Governor urged residents of the area to take ownership of project and other facilities provided across the State by government and protect them, noting that the projects were being executed by their taxes. “The truth is all these projects are more or less a return from the tax you are paying to government and so we are going to appeal to ourselves. Whatever little amount that you are paying as taxes, believe me you will get greater value in return and that is why you are able to get all these projects. “So, I just want to encourage our people to continue to pay their taxes. Trust us, we will return your taxes in form of all these facilities that will make life more comfortable for all of us,” Governor Ambode said. The Governor also said that his administration would support the Agboyi-Ketu Local Council Development Area (LCDA) in the construction of the new Akinyemi Market, while assuring that those whose shops were affected by the project would be given priority. Earlier, Chairman of Agboyi-Ketu LCDA, Mayor Dele Oshinowo thanked Governor Ambode for transforming the entire Alapere axis, saying apart from improving on the aesthetics of the area with good road network and street lights, the project had also increased the health of the people and economy of the area. Also, a community leader, Chief Duro Dada and Chairman of Community Development Committee (CDC) of Agboyi-Ketu LCDA, Chief R.O Ajayi said the project had transformed the area to a mega city. “Today is a great day in Alapere. I have lived for about 30 years in this area and I want to thank Governor Ambode for transforming our area into another Ikoyi. As a matter of fact, people don’t want to sleep at night again because of this quality road and street light. The Governor has transformed the economy of our area and I want to assure him that we will vote for him again in 2019,” Dada said. 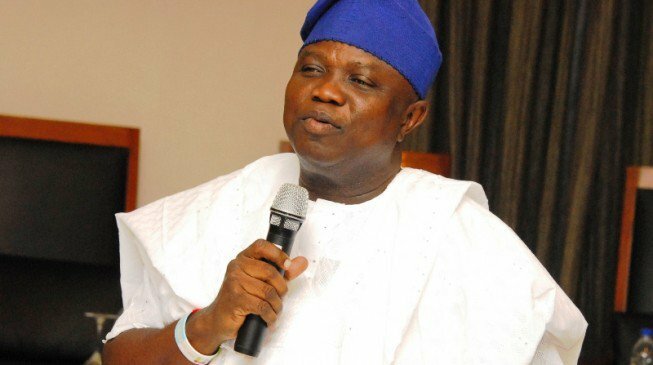 Lagos State Governor, Mr. Akinwunmi Ambode on Friday justified the decision of the State Government to shut down the Olusosun dumpsite in Ojota, saying the location of the facility was no longer healthy both for trading activities and residents living in the neighborhood. Governor Ambode, who spoke while addressing scavengers and other workers at the site following the outbreak of fire last Wednesday, said aside the negative health implication of the site to the people, the structure of the facility was also risky and susceptible to all forms of hazards like the fire outbreak. 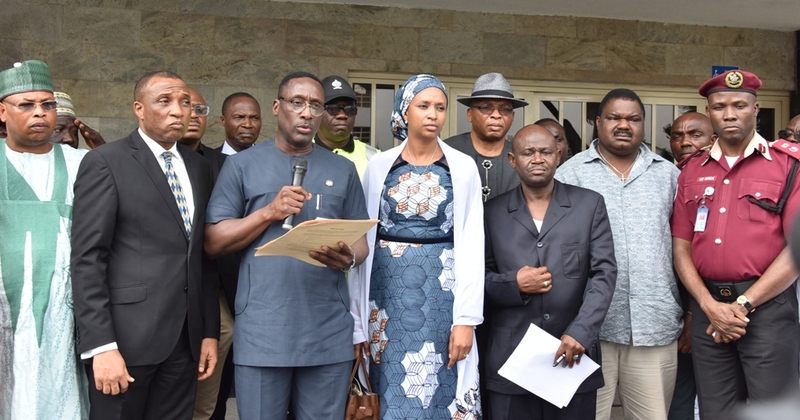 The Governor, who was visiting the site for the second time since the fire outbreak, said though it was gratifying that there was no casualty, the closure of the site became necessary owing to the need to forestall future occurrence and protect the health of residents. “You see what happened is not as if anybody put fire there. It is the refuse that are dumped there as well as the gas coming from underground and the hot sun which was around 36 to 38 degrees that caused the fire. We thank God nothing bad happened to those living there and around the neighborhood. “What we have decided now is that there will not be dumping of refuse here any longer. But the most important aspect of it is that I cannot open my eyes and allow diseases to befall you here. At the end of the day, it is government that will still care for you. So, we have to sit down and agree. “We might say we are looking for what we want to eat but may God not allow us to see what will harm or kill us. I don’t want to stop your trade but I also don’t want to fold my arms and allow diseases befall you. You may not have diseases now, but you see in this area, there is no way you can say you are looking for money without contending with series of hazards and a clear example is the fire outbreak,” the Governor said. 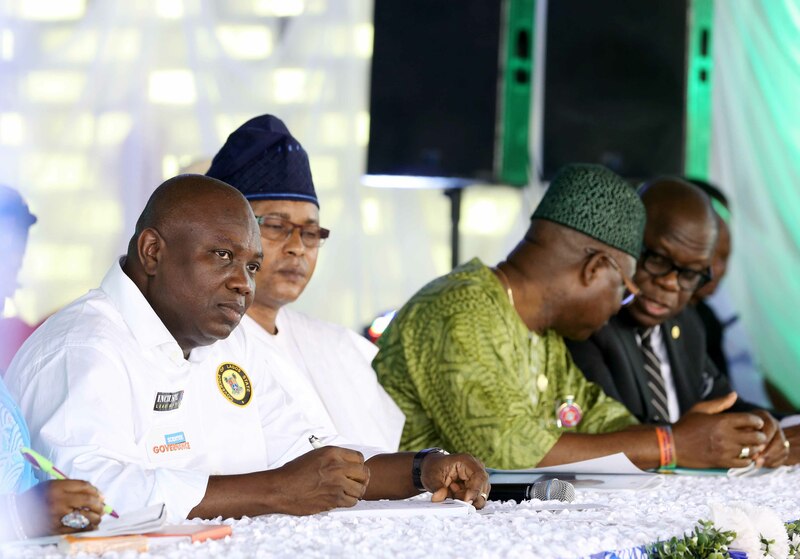 Governor Ambode said in as much as government was unwilling to make people in the area lose their means of livelihood, but that it was important for all the stakeholders to agree on what to be done going forward. “I have not come to disturb you; what should be removed will be removed; we are not dumping waste here again. What will benefit all the people here is my concern. But we have to take it one after the other and we want all your leaders to cooperate with us. “If not for the fact that we have fire stations, vehicles and fire officers, the fire would have spread more than this and if the fire had spread to the petrol station, that would have been a major disaster and we don’t want that to happen. “It’s too dangerous to have this petrol station and other things here. It’s for your own good and for your own health. But we are not here to cause pain for you, we would first of all make sure that we close down the dumpsite and then at the same time engage all of you so that we can talk and see how we can improve on the environment and also make life bearable for you and your children,” Governor Ambode said. Also speaking, Commissioner for Information and Strategy, Mr Kehinde Bamigbetan said the visits of the Governor and the decision of the State Government to shut down the site was to protect the people and the environment and to ensure their health and safety. While directing waste collection operators to make use of the landfill site at Owu Elepe in Ikorodu and that of Epe, Bamigbetan also unveiled plans to transform Olusosun dumpsite into parks and gardens, among others, starting with perimeter fencing. “Consequently, waste collection operators are directed to use the landfill site at Owu Elepe in Ikorodu and the second one in Epe. The government has also decided to fence the site. Other efforts to contain the situation include the decommissioning of the site to facilitate alternative use for parks and gardens and other projects. This action is in line with the Cleaner Lagos Initiative (CLI) of this administration and conforms with international best practices,” Bamigbetan said. The Lagos State Government on Wednesday clarified the figures circulating in the media on the rate for the newly reviewed Land Use Charge Law of 2018, saying many of the numbers were based on several years of arrears on the levy not paid by affected property owners. Speaking at a news briefing held at the Bagauda Kaltho Press Centre in Alausa, Ikeja, the State’s Commissioner for Information and Strategy, Mr Kehinde Bamigbetan said there were so many misconceptions and misinformation about the new law, adding that the law was a progressive enactment duly made by the House of Assembly and handed over to the Executive for implementation in the overall interest of the people. He specifically dismissed the humongous figures being bandied about on the social media, saying many of the calculations were based on arrears of many years of non-payment. “The fact is that this law took a long process to be made. It started as a bill and went through the first reading, second reading, public hearing to which all stakeholders were brought together to debate it and some of the relieves we have seen were part of the debate expressed by the stakeholders about the need to protect the vulnerable segment of the society. Having made the law, the Lagos State House of Assembly has handed it over to the executive to implement. “The second important part is that a lot of relieves have been built into the law but many people are confusing arrears with the actual figure. If you see those figures, ask whether it is for one year or arrears of several years of non-payment. The humongous figures that are being bandied around particularly in the social media relate to the arrears of many years of non-payment which are computed together,” Bamigbetan said. Also speaking, Commissioner for Finance, Mr Akinyemi Ashade said the government has extended the period for tax payers to enjoy the 15 per cent discount in the reviewed Land Use Charge Law to April 14, 2018 in order to enable the implementation and enforcement of the new law, as well as allow many property owners to benefit from the discount. Ashade, who took time to clarify reactions in some section of the public on the new law, said under the old law, which had not been reviewed for over 15 years since 2001, the Land Use Charge rate was totally inaccurate and retrogressive and was depriving the State of keeping track of all economic activities that relate to land in Lagos State. He said the Law, which was reviewed by the Lagos State House of Assembly and signed into Law by the State Governor, Mr. Akinwunmi Ambode on February 8, 2018 is a merger of all Property and Land Based Rates and Charges in the State. Ashade said: “There was an urgent need for the repeal, as the old law had not been reviewed for over 15 years, since 2001. Under the old law, the LUC rate was totally inaccurate and retrogressive which deprived the State of keeping track of all economic activities that relate to land in Lagos State. “The new law is a consolidation of Ground Rent, Tenement Rate, and Neighbourhood Improvement Levy. This charge is payable annually in respect of all real estate properties in the State, which means owners and occupiers holding a lease to a Property for ten (10) years or more are now liable to pay the annual LUC invoice charged. Explaining the calculation of amount payable, the Commissioner said that property owners can determine the amount by multiplying the Market Value of their property by the Applicable Relief Rate of 40 per cent and Annual Charge rate. “Upon receiving a notice or not, the new law has made it possible for owners to calculate their charge, and enable prompt payment, which allows them to benefit from a 15% discount for early payment, applicable to payments made within 15 days of receipt of Demand Notice,” he said. Responding to fears of tenants that the new Law might force landlords to increase rent, Ashade said aside the fact that the Lagos State Tenancy Law 2011 was still in force, the incidence of payment for Land Use Charge under the new law is on the Landlord and not the tenant. He said the minimum rate was only increased from N1,200 it was in 2001 to N5,000, while there is provision for self-assessment and Assessment Appeal Tribunal under the new law. On vacant properties, Ashade said such would be treated based on owner-occupier and not as a commercial property, explaining that the target of government is to make commercial property owners to pay a little bit more. I welcome you to our 10th Quarterly Town Hall Meeting. It is very significant that we are gathered here today in the State Capital, Ikeja to listen and interact with residents of Lagos West Senatorial Zone. 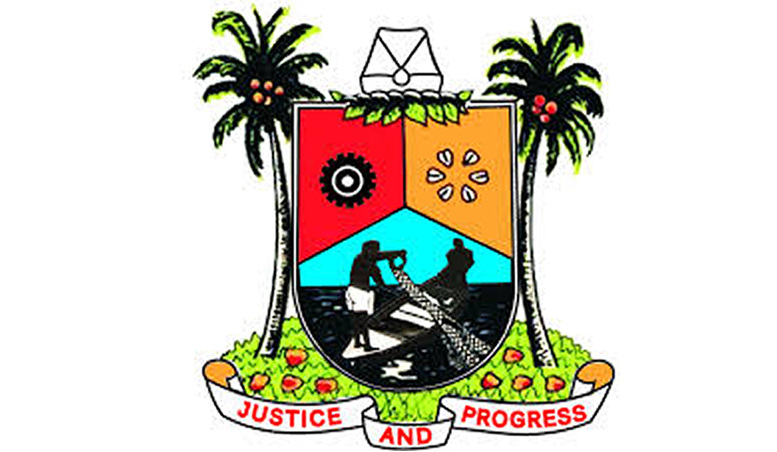 Town Hall Meetings practice in Lagos will be 140 years old this month. Holding this particular event in Lagos cannot be more historic. Ladies and Gentlemen, we are entering the New Year with confidence because our State is on a solid prosperity footing and with a lot of interesting prospects for all Lagosians. As we celebrate entering a new year, we thank you all for your support and cooperation last year. It was your backing that enabled us to achieve the modest successes we recorded last year and commence the transformation of the landscape of our State. In the last year, we delivered on our promises to Lagosians despite the harsh economic climate. Despite the harsh economy, our State budget performed at 82%. Total Revenue Generated was N503.7bn representing a performance of 78%; Total Recurrent Expenditure was N281.33bn, a performance of 92% while Total Capital Expenditure was N387.60bn or 76% performance. · As at December 2017, the Lagos State Employment Trust Fund had disbursed N4.5billion to 5,500 beneficiaries who also received training on financial literacy and business management. In fulfilment of our promise to our students in tertiary institutions across the State, this administration disbursed a total sum of N635.5million to 8,419 students across the State. Our government acquired healthcare equipment worth N2.5 billion. The equipment will strengthen the capacity of our health facilities to render improved health services and also facilitate smooth take off of the Lagos State Health Scheme which is designed to enable residents enjoy unfettered access to qualitative healthcare. Since the last Town Hall meeting, we have continued the renovation and upgrade of our primary healthcare centres and our people at the grassroots have started to witness a revitalized healthcare delivery. other Technical Colleges bringing the number of Technical colleges in the State to Eight. To kick-start our Bus Transport Reform, we commissioned the LAMATA Place, the Ojota BRT Depot, the Intelligent Transport System Centre and our E-ticketing Payment System. Construction has started at the Onikan Stadium to transform it to a modern sports arena. The Agege Stadium has been upgraded to prepare it to host CAF Champions League matches. We commissioned the JJT (Johnson, Jakande, Tinubu) Park in Alausa. Since the commissioning the park has witnessed patronage in excess of its capacity and confirms our belief that Lagos needs more of such parks. security and health sector. Like I said when the budget was presented, this budget has something for everyone including the people of Ikeja. We have already kicked off for the New Year. Just this week we have commissioned the Safety Arena in Oshodi and performed the ground-breaking ceremony for the new J. K. Randle Centre. We will continue at this pace and vigorously pursue all on-going projects. As you can observe, we have commenced work on the construction of the 1.4 kilometre Pen Cinema Flyover/Bridge. Our strategy is to start year 2018 with programmes that will stimulate the economy, accelerate growth and create opportunities for all Lagosians to thrive. We are determined to continue to secure the State, improve the wellbeing of all residents and ensure all taxpayers enjoy the dividends of their contributions to our commonwealth. Distinguished Ladies and Gentlemen, the task of building the Lagos State of our dream is enormous but we remain focused and committed to this project. There is still a lot of work ahead and our government will not relent in our efforts to give you the best service possible. I urge all taxpayers to be alive to their responsibility of fulfilling their obligations to the State. Regular payment of taxes remains the major source of funding the infrastructure being put in place to ease transportation, provide security build new roads and refurbish existing ones. I now welcome your questions, suggestions and submissions. Once again, I wish you all joyous, peaceful and prosperous 2018.